Het Volk, 15 February 1936. The newspapers of the Third Reich made the most of the murder of the Nazi Wilhelm Gustloff in Switzerland by the Jew David Frankfurter. 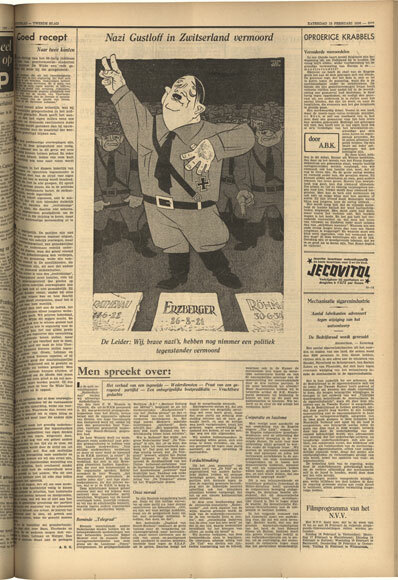 In his cartoon for Het Volk, Peter van Reen primarily takes issue with Hitler's claim that 'we, well-behaved Nazis, have never murdered a political opponent'. Following complaints from various parties, including the German newspaper the Völkischer Beobachter, the chief editor of Het Volk Johan Frederik Ankersmit was summoned on suspicion of having 'intentionally insulted the head of a friendly state'. The Germans were particularly upset about the 'unfavourable facial characteristics of Hitler and the SA men' depicted in Van Reen's cartoon. Following a long court case Ankersmit was acquitted on 4 February 1937.